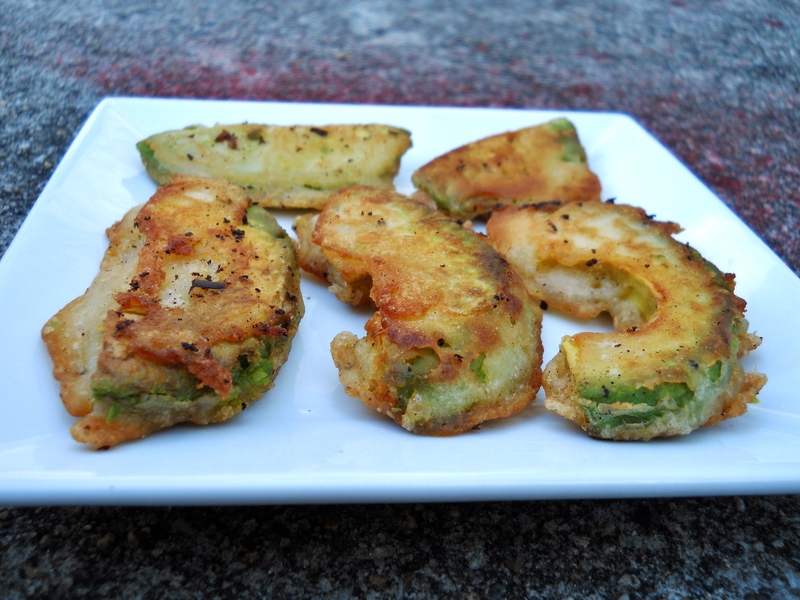 Beer-Battered Avocado Slices « What will I cook today? Avocado: So delicious, that any further preparation besides peeling, pitting, and plating is unnecessary. But when I have beer batter left over from making these again, and half an avocado in the fridge… well… It’s time to shake things up. And I’m pretty happy I did. Mix together the flour, beer, salt, and pepper. This will make more than you need, but makes for easier dipping/coating. Next time, I would add more spices to the batter–minced garlic, paprika, red pepper, etc have been used in other recipes on the interwebs. Heat vegetable oil in a fry pan–the amount depends on the size of the pan you use; it doesn’t have to be a lot. Test the temperature by dropping a bit of batter into the oil. A sizzle means you’re good to go. 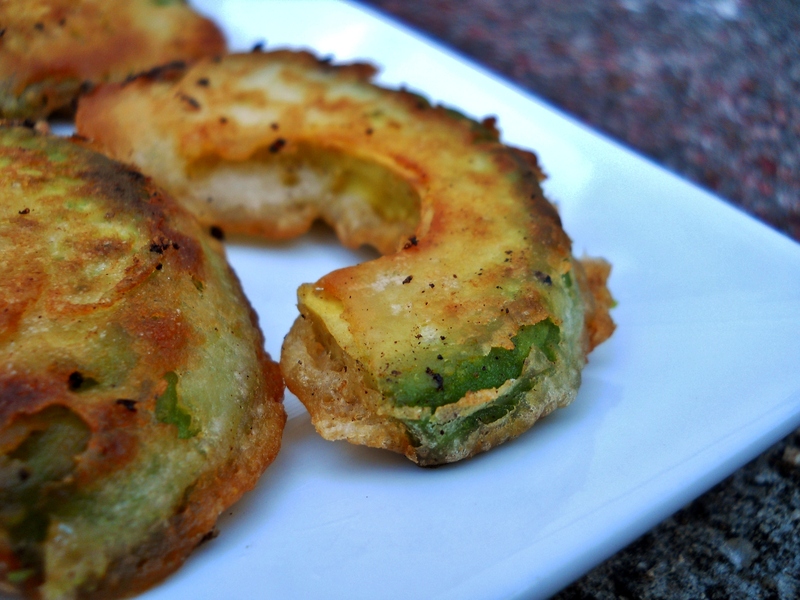 Dip each avocado slice into the batter, let the excess drip off, and then place gently into the hot oil. Be careful as the oil may spit. Fry until golden brown, flipping for even cooking. I recommend consuming with a dip, such as yogurt-mustard dip: mix the yogurt and mustard. Voila. These were pretty tasty. As stated, I would add more spices to the batter. 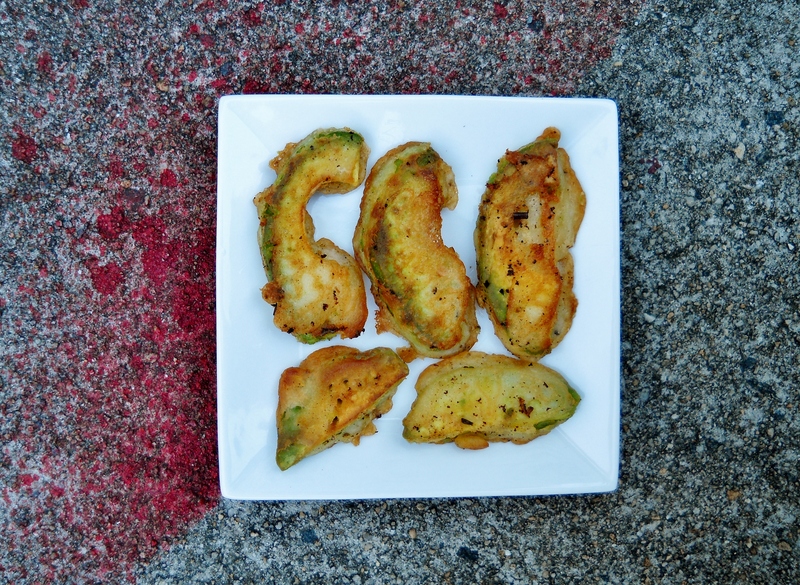 I used the same beer batter that I used for goat cheese stuffed zucchini flowers; while the tangy goat cheese complemented the more subtle beer batter nicely, avocado is already mild in flavor, so a more strongly-spiced beer batter would have been better. However, eating with a mustard-yogurt dip perked things up well! Crispy, creamy, tangy, satisfying. 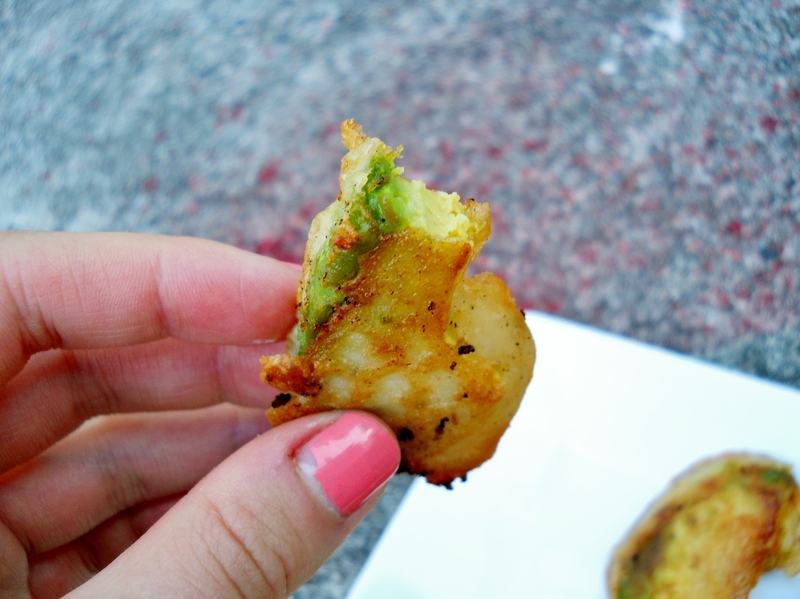 I don’t normally go for fried foods but there’s something about beer batter… Yum. This entry was posted in Cooking and tagged appetizer, avocado, beer, fried, savory, snack, vegan, vegetarian.